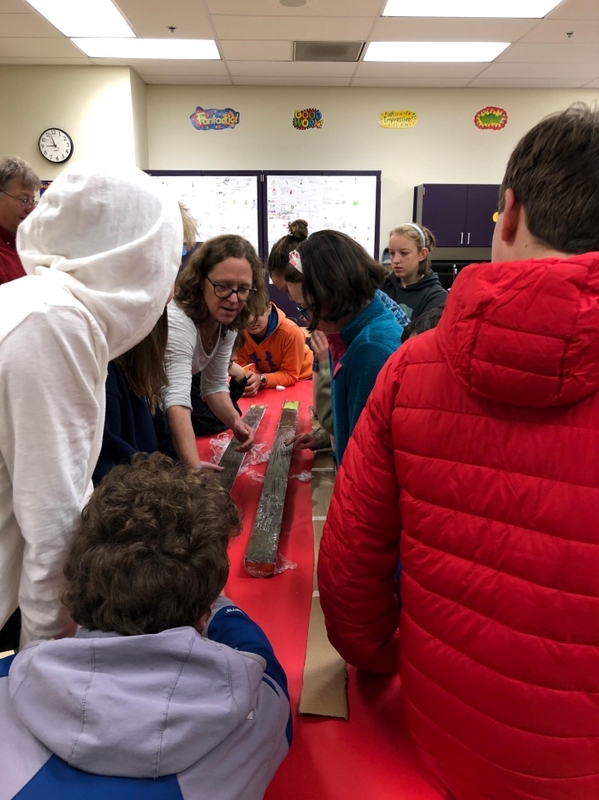 As a Scientist in Residency Fellow (SIRF) guest speaker in Sitka, Alaska, hydro geophysicist, Dr. Rachel Lauer, recently presented lessons on investigating submarine seismic cores to local middle school students. As an assistant professor at the University of Calgary she expected to work with these students in the classroom but did not anticipate interacting with them few days later during an unrelated community event. In spite of being dressed as a scary skeleton at a haunted aquarium event, Lauer was approached by two seventh grade girls who had been inspired by Lauer's classroom lesson that simulated her ocean floor studies on board a research vessel. ``They shyly came up to ask a me if I get seasick and if I like being on a ship and then they told me how much they liked having me in their class," said Lauer, who studies the Queen Charlotte Fairweather Fault. She had similar experiences at the local coffee shop and pubs a week after giving a presentation to the general public. Scientist in Residency Fellow, Dr. Rachel Lauer, shows 7th grade students in Sitka, Alaska how she works with submarine cores. Photo courtesy of Kristina Tirman. 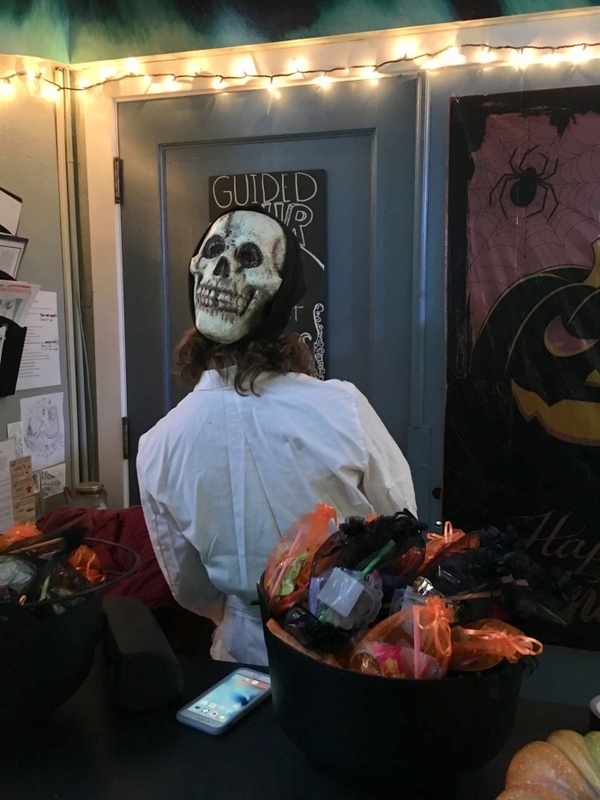 Dr. Lauer getting into the spirit of a community Halloween event as part of her Scientist in Residency Fellowship in Sitka, Alaska. Photo courtesy of Lisa Busch. Informal community interactions like this are exactly what the Scientist in Residency Fellow (SIRF) at the Sitka Sound Science Center (SSSC) seeks to promote. Capitalizing on the kind of casual way that people in Alaskan rural communities have of getting to know people is what makes Sitka Sound Science Center's SIRF model so unique. The month-long fellowship is set up to allow rural community members the chance to get to know scientists and learn about polar research by seeing them in the community over an extended period of time. Funded by the National Science Foundation, SIRF is designed to help communities learn about polar research and broaden participation in Science, Technology, Engineering, and Mathematics (STEM) disciplines. The Fellowship facilitates community engagement activities for polar scientists and provides time for them to work. The SIRF Fellowship provides mid-career scientists with a one-month mini sabbatical. Over the course of the month, the fellows work independently on a project, such as finishing a book, preparing data for publication, or setting out a new proposal. They receive some basic science communication training and then participate in a variety of facilitated community engagement activities that may include presenting to the general public, going into schools, being interviewed on public radio, sitting in bars and cafes to talk about their work, meeting with community stakeholders, and leading family field trips. "We like to try new things with scientists," says SIRF director and SSSC research director Tory Curran. "We look for creative ways to engage the community in research by introducing them and giving them time to get to know the scientists themselves," she adds. Community members often invite SIRF fellows for dinner, on skiff rides, kayaking, or hiking. Scientists then have time to get to know people who live in a rural place and the kinds of questions and insights they have about the natural world. Sitka Sound Science Center (SSSC) is a nonprofit dedicated to improving understanding and awareness of the marine and terrestrial ecosystems of Alaska through science research and education. As a field station and marine laboratory, the Center began with the purpose of carrying on the research and science education legacy of Sheldon Jackson College, a small Presbyterian- affiliated school in Sitka, that started in 1880 as an Alaska Native Training facility but shut down in 2007. The Center immediately occupied the old science laboratories and classrooms of Sheldon Jackson, purchased the building, and then began building rigorous research and education programs. Today it facilitates millions of dollars of research important to the region and puts on award-winning educational programs that are assisting the local school district increasing STEM and Arctic literacy for all students and closing the academic achievement gap in science between Alaska Native students and non-Native students. Lauer participated in putting on a haunted aquarium event at the Center, went to a tribal natural resources committee meeting, attended a Tlingit mourning ceremony during Alaska Day festivities, participated in the launch of a new beer supporting Sitka WhaleFest at a local brewery, and was interviewed by the local public radio station KCAW. For each of the fellowships, SSSC works with scientists to help them navigate the culture and structure of isolated rural Alaskan communities. The Fellowship introduces them to key members of the community including tribal and government entities, local media, teachers, stakeholders in community organizations, and allows them time to work independently. The evaluations from the SIRF Fellows and from the community members show that everyone gets something out of the experience. Of the 31 SIRF Fellow Alumni, 15 have come back to the region to work on new research questions. While the program has done a good job exposing rural Alaskan students, including Alaska Natives, to polar sciences and it has provided excellent community engagement opportunities for scientists, SSSC would like to expand the fellowship to include interdisciplinary pairs in which scientists apply for a fellowship with an artist, an Indigenous culture bearer, or a researcher from another discipline. The Interdisciplinary Scholars in Residency Fellowship (iSIRF) is intended to reach members of the community not yet attracted to science. Additionally, SSSC would like to provide more science communication training for fellows throughout the month, and study and document the impact of the Fellowship so that the SIRF model can be shared with other field stations and rural communities in the Circumpolar North. More information about the SIRF fellowship applications is found on the Sitka Sound Science Center website. Lisa Busch is the Executive Director of Sitka Sound Science Center. She has lived in Sitka for 30 years. Before coming to SSSC, she worked as a science journalist and produced Encounters: Radio Experiences in the North.